Growing up in Springburn all my life was never the easiest, but thankfully there was always a spare bit of grass or concrete were I could kick a ball. Being out from 9am to 9pm was pretty much how it was for me from a young age, and most of the time it entailed having a ball with me… Even when sent to the shop at the end of the street, I always took my ball and worked on my dribbling or running with the ball or I would play one-twos against the wall, all the way up and back… That was pretty much my way of learning and developing my football skills! “Street Fitbaw” was everything for me as a youngster, and I believe a massive part of developing me into the footballer that I am today. You did’nt have a set position , you attacked , you defended , did’nt have a coach telling you what to do , You just used your imagination and learned from your own mistakes. I very rarely played any organised football for teams, in fact I would suggest I played no more than a dozen organised games between the ages of 5 and 16! Thankfully at the age of 13 I came across Futsal, also known as JOGA BONITO. Joga was a 3-a-side tournament played all over the UK, and in Glasgow it ran 4 nights a week – Mondays in Haghill, Tuesdays at Celtic Park, Thursdays in Castlemilk and Fridays in Scotstoun. Myself and my two friends would make sure we attended pretty much every night – 3v3 small area, no goalkeepers, all about creativity, teamwork, movement, attacking and defending… I LOVED IT! “3 of a Kind” was our team name, and will be something I will never forget. I still think about some of those nights; Scoring the winning goal in the first-ever competition final against some of the so-called best players in Glasgow, or a nutmeg on a friday night final at Scotstoun, I just loved everything about the small-sided games, close control, nutmegs, skill and imagination which suited me down to a tee! We finished on the rankings as 4th best team in the UK, which qualifed us for the British finals to be played at Highbury (the last ever game to be played there) which was another amazing experience. Unfortunately, we didn’t quite cover ourselves in glory down there, although I put it down to the travelling… none of us were keen travellers, so the plane down, followed by a 3-hour bus journey, then straight into games wasn’t the best preparation – but either way, I had found something that I loved in Futsal! I started to get a bit more recognition for my football as I joined an amateur team at the age of 17, which was pretty much my first proper team. This led me to trials at Motherwell and Queens Park (both unsuccessful). I then spent a couple of years between St Rochs Juniors and Glasgow North Amateurs, before signing for Petershill Juniors which was a dream come true for me… I had grown up on Petershill Road and attended every Petershill game possible, but never ever did I imagine playing for my local club. After a year I decided to move again and joined Blantyre Vic’s where both as a team and personally we had a very successful spell, winning two league titles back-to-back and playing in three cup finals. In 2015 I was approached by Queens Park and asked to sign… Who would have ever thought that after being rejected at 19 years old, I would get the chance at 24 to play senior football! Playing for Queens Park has been unbelievable – something I never thought I would experience, from the opportunity to play at Hampden every second week or endure those long horrible bus journeys to places like Peterhead or Elgin, to scoring the winning goal in the league two play-off final against our closest rivals Clyde! That goal would eventually finish up voted as the 2nd BEST GOAL IN THE WHOLE OF SCOTTISH FOOTBALL for the full season! It has been surreal at times, but for me everything I have achieved in football all comes down to me discovering Joga Bonito and Futsal and combining this with all the skills I had learned at ” Street Fitbaw “. Kids often ask me when I am coaching: “What pro youth team did you play for?” or ””What academy were you involved with when you were my age?”. The truth is I don’t even think I had heard of pro youth at their age! I went out and played with my pals, nobody telling me do this or do that – I just enjoyed using my imagination and being creative which I still do to this day. 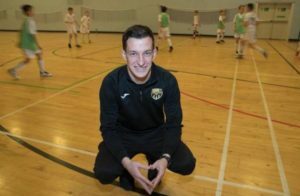 My development came about purely because of Futsal – Futsal had me working on my close control, decision-making, being creative, defending and attacking situations and much more. It set great foundations for me as a footballer. I suppose that raises a couple of questions… What if I was introduced to Futsal at a younger age? What If I had played organised football at a younger age? What if I could have combined them at a younger age? Would I have developed into a better player? Who knows! I only know from my own experience that the benefits of being involved in Futsal were huge, and I would never achieved what I have without Futsal! Now, as a coach, it is really important for me to provide an enviroment where kids are giving freedom to go make their own decisions, figure situations out for themselves, use their imagination, be creative and really enjoy the game of futsal…just like I did all those years ago.